A sweatshirt is a necessity on board a ship. Most of the rooms on the ship are kept very cool. There is, however, a short section of the passageway on the main level of the R/V Thompson where you can briefly experience tropical warmth. Walk through the door on the side of the passage and you have entered a whole new climate zone. You have entered the engine room. The door itself is rather intimidating. "Danger! High Noise Level. Wear Ear Protection." "Caution! Wear Eye Protection." "When Alarm Sounds, Vacate at Once!" Open the door and you are overcome by the piercing whine of the engines. A view looking down into the engine room of the R/V Thompson. But one of the engineers will ease your trepidation by handing you a pair of ear phones and cheerfully leading you down the stairs. 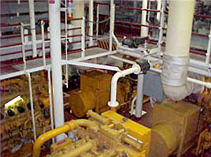 Below are the ship’s six engines. The forward three, which are 2,100 horse power each, run the ship’s motors. The rear three, which are half the size, run the ship’s services such as lights, computers, kitchen appliances, washing machines, and air circulation. In a pinch, they can also run the ship's motors. Not all of the engines run at once, however. Typically, only one of the large engines runs the propulsion when the ship is towing an instrument over the side, two if the ship is in transit, and only one of the smaller engines runs all of the ship’s services. The control station where monitors display the status of the equipment in the engine room. Across the walkway above the engines is a small room (the control room) where you can take off the ear phones. On one side, windows look out over the engines. On the other side, computer monitors, buttons, and gauges cover the wall. The engineers can start or stop each engine simply by pushing a button. One screen shows which engines are on line and where the power is being directed. A panel shows the shaft and propeller speed of the motors and the direction they are pushing the ship. Another screen provides information on all aspects of how the engines are performing, from the oil pressure to the exhaust temperature. If a problem occurs, an alarm will sound. The engineer can then scroll through the screen, identify where the problem is, and if necessary shut down the engine. Obviously one of the greatest concerns is fire. The ship can hold up to 300,000 gallons of fuel, so it is easy to imagine how bad things could get. Should a fire break out, the first option would be to fight the fire with hoses. If the fire got out of hand in the engine room, the engineer could seal off the fire doors and as a last resort flood the area with either foam or halon gas. The halon gas would suffocate the fire but would also suffocate anybody trapped inside. Put on your earphones, descend a flight of stairs and you are amongst the engines. Each engine turns a generator that produces up to 600 volts of electricity. A giant switchboard directs the power to motors or the ship’s services as needed. The ship has three motors. In the back, there are two propeller drives called Z-drives. These are the main motors that propel the ship forward. The ship does not have a rudder. Instead, the shafts of the Z-drives can rotate the propellers 360 degrees and can therefore steer the ship in any direction. The third engine, called a bow thruster, sits in the front of the boat. It is used exclusively to maneuver the ship, although on a calm day, it can pull the ship forward in a pinch. The bow thruster takes in water then pushes the water out through a diffuser. Just as the propellers of the Z-drives can rotate in any direction, the diffuser can push the water out in any direction and therefore can push the bow in any direction. The combination of the two Z-drives and the bow thruster enable the officers on the bridge to maneuver or pivot the ship every which way. A computer on the bridge controls all three motors and keeps the ship on course. 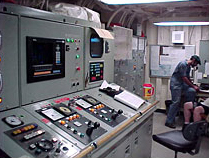 If the computer fails, the engineer could manually control the ship’s course from the control room. The officers on the bridge must determine the safest, most efficient route to take. First they decide which direction to point the ship. This is called the heading. But the ship does not necessarily move in the direction it is pointing. Depending on the direction and strength of the wind in the current, the officers may decide to guide the ship at an angle or even sideways. This maneuver is called "crabbing." By choosing the right heading, the officers reduce the amount of work the engines must exert. The officer on the bridge then enters the heading, destination, and desired speed into the computer. From then on, the computer, not the officer, keeps the ship on course. When you are on a ship for four weeks, working long, often tedious hours, you need something to look forward to. Good food three times a day goes a long way towards lifting everybody’s spirits. The people who work in the galley face a daunting challenge. They must keep as many people as possible as happy as possible. Here are some of the hurdles they must overcome. 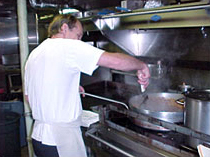 The cook prepares for the evening meal in the galley. They must bring enough food to feed a ship full of people for 30 (or more) days. Obviously they cannot stop at a supermarket part way through the voyage to pick up items that are running low. For most items, they have worked out a formula. For example, for a full ship (58 people), they need four gallons of milk and 30 to 40 pounds of meat per day. There are also additional complications. The United States has strict regulations on bringing agricultural items from other countries. Whenever the ship returns from a foreign country, the ship must not have a trace of food left on board. Food goes bad when it sits around for a while, especially items like milk, eggs, vegetables, and cheese. So the cooks must bring food that will last a month or more. They store the food in a special refrigerator that circulates the air around it and keeps the food at a constant temperature. The cooks must enter the refrigerator to retrieve the food as few times as possible. As for the milk and cheese? They freeze it. People on the voyage come from a variety of different places and have a variety of different eating habits. There are vegetarians. There are people who are allergic to certain foods. There are people who can’t eat certain foods for religious reasons. And there are people who only like certain foods. The trick is to serve a wide variety of foods. If there are foreign nationals on board who are only used to certain things, they try to cater to their tastes. Variety is also important to those who will eat anything. Any dish, no matter how good it is, gets pretty old after four weeks. Barbeques on the aft deck are a Sunday tradition. One of the highlights of a cruise is a cookout on the deck. These usually occur on Sundays.